See the Pen  Apple Watch Scroll Border | @keyframers 1.20.0 by @keyframers (@keyframers) on CodePen. See the Pen Horizontal Scrolling with Scroll Out by Christopher Wallis (@notoriousb1t) on CodePen. 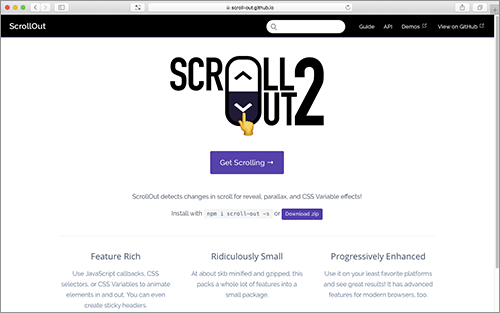 See the Pen Lazy-Load images with ScrollOut by Christopher Wallis (@notoriousb1t) on CodePen. See the Pen Scaling Gallery on Scroll by Christopher Wallis (@notoriousb1t) on CodePen. See the Pen ScrollOut + Splitting.js by Shaw (@shshaw) on CodePen.